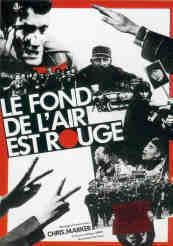 Watching Chris Marker's Le Fond de l'air est rouge (A Grin Without a Cat) last week made for a somewhat ambivalent experience: even though the film is, ostensibly, a catalogue of disappointments, its registering of a time when there were challenges - no matter how inchoate, messy, contradictory - to the existing order, cannot but offer some inspiration in these much bleaker times. A Grin Without a Cat, originally released in 1977 but given a new post-89 epilogue by Marker in 1992, is an epic montage-meditation on what Marker called 'the Third World War': the hydra-headed revolutionary or would-be revolutionary struggles of the Sixties and the Seventies. Marker constructed the film entirely out of archive material, shooting no original footage, and producing associations, connections, foreshadowings and echoes through masterly editing. The effect, especially if you are not minutely familiar with events in France, Vietnam, Algeria, Bolivia, Cuba and Czechoslovakia is disorientating, vertiginous. You find yourself Quantum-Leapt into the middle of a jostling crowd scene; no sooner have you got your bearings there when you abruptly find yourself in another place, another time. Marker's commentary - spoken by a number of actors - gives you clues, epigraphs, rather than explication. But Marker's aim not to render the period from 67 to 77 as Objective History to be ponfiticated upon by 'experts' for whom the Meaning of the events is already established, nor, even worse, to produce a vanguardist version of I heart 1968, in which sighing former revolutionaries look back on anger with the tender contempt of contemporary 'wisdom'. No, the point was to present the events 'in becoming', to restore to them a subjectivity (in the Kierkegaardian sense) that retrospection structurally forecloses. 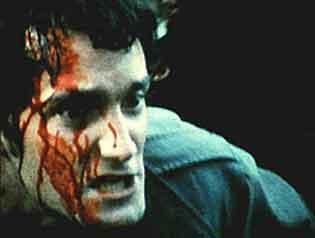 At one stage in the film, Marker's commentary ruefully notes that while revolutionaries, failed revolutionaries and ex-revolutionaries devoted all their attention to the formation of the New Left, the New Right was coalescing, unnoticed. Cue images of Valery Giscard D'estaing playing football in a carefully-cultivated attempt to look sporty and modern. The PR director of Citroen muses on the 'science of management' (too complicated, he says, for even the most talented Union member to master) and looks forward to the incorporation of leftist desire into Capital that would become post-Fordism. Cut to now, where the images of even an ultimately failed militancy belong to a past. A past that was not - in one sense - even mine, that was over before I was born in July 1968. Yet the reverberations continued for a few years yet, were an unacknowledged (by me, then) background to the Things that I enjoyed in the late 70s and early 80s. For those of us arriving after the event, the significance of the convulsions documented in Marker's film could only be apprehended much later, once their effects had completely ebbed away and the reality (and the pleasure) principles were Restored. Marcus' Lipstick Traces - whose temporal jump-cutting in many ways recalls that of Marker's film - goes some way to establishing the connections between the events remembered in A Grin Without a Cat and those that began in the UK at more or less the time that the film was completed. A cheshire cat's grin, lipstick traces on a cigarette, spectres of Marx: Marcus, Derrida and Marker come to see ruptures, revolts and revolutions as ghostly residue, thin stains on the seamless surfaces of post-Cold War Capital. The untranslateable French title of Marker's film suggests possibilities that hovered and haunted without ever making themselves real. At the Marker conference held at the ICA a few years ago, Barry Langford argued that, 'rather than the spectre of Communism famously invoked by Marx in the opening lines of the Communist Manifesto', for both A Grin Without a Cat and Marx's 'The Civil War in France' a hundred years before it, 'it is the phantom of revolution that haunts Marx and Marker alike - that is, the fear that revolution will ultimately prove, precisely, phantasmic'. If Marx and Marker's fear was that revolution would only be a spectre, our suspicion is that it will not turn out to be even that, that the stricken ghosts have been put to flight once and for all. (And even the 'death of communism' is not enough for the guardians of the new status quo, for whom 'communism is not dead enough - ... they will only be content when they have driven a stake through its heart and buried it at the crossroads at midnight.' Seumas Milne, via IT). The struggles in A Grin without a Cat might have been defeated, might even have contributed to a more ferociously effective Reaction, but the pressures that those events brought to bear almost had very immediate effects - by contesting the Possible, by rejecting 'realism', they could not but have altered expectations about what was acceptable in the workplace, about what could happen in everyday life. The revolutions were cultural; which is to say, they understood that culture and politics could not be conceived in isolation from one another. Both Althusser and the situationist-inspired students of 68, in many ways so opposed, could agree on at least one thing: that cultural products were never merely cultural. In their condemnations of recuperated Spectacle and Ideological Apparatuses, they granted a weight to cultural products which few would countenance now. I felt the contrast between what Marker's film recounted and contemporary realities especially painfully last week when I went on a TUC training course with members of NATFHE from other FE colleges. The stories of increased casualization, of newly punitive sickness policies, of lecturers being sacked and forced to re-apply for their jobs, of the imposition of more and more targets and 'spurious measurables', each entailing yet more pointless, windowdressing paperwork, confirmed what, individually, we all already knew. The Further Education sector is in crisis; its problems only symptomatic of a wider malaise in UK education as a whole. Further Education colleges, out of Local Education Authority control since 1992, show the way in which a 'reformed' (i.e. part-privatized) education will develop. The recent report which stated that students spoonfed at A-level cannot cope with university study would come as little surprise to few A-level teachers and lecturers. The pressure to meet government targets means that quality and breadth of teaching is sacrficed for the narrow goal of passing the exam: an instrumentalization of education that fully accepts that its only role is to reproduce the labour force. Far far away from 68, at the core of whose conflagrations was education, and the question of what it could be: could it be more than an ideological training camp, a carceral institution? One thing that occured to me last week, prompted by the contrast between Marker's Then and our Now, was that the third way is not entirely a phantasm, an ideological dupe. There is in fact a reality to the third way, and it is the reality of bureaucracy. That is what is left once politics has become administration. It's hard to believe that public services are not more clogged with bureaucracy than they were pre-Thatcher. Certainly, education is choked with the stuff... targets, action plans, log books, all of them required conditions for funding by the Learning and Skills Council, and assessed by Ofsted, whose threat no longer takes the form of an invasive external entity arriving every two or three years, but has become introjected into the institution itself, through the permanent panoptic vigilance of a bloated managerial strata determined to over-compensate in order to fully ensure it is meeting central government's demands. This is the reality of 'market stalinism' in education.